PLEASE NOTE: Finding your ACCURATE Draw Length is critical to arrow selection. We talk to folks quite often who believe they know their true draw length but discover that they have measured incorrectly (if unsure, please see our Post on Measuring Draw Length). All types of arrows (wood, aluminum, carbon) can be shot from your Bob Lee bow. But regardless of arrow type, it is important that your arrows are correctly spined (have the correct spine stiffness) for your draw weight. With the variables in spine ratings, shaft materials and grain, selecting the best arrow for your traditional bow can be a daunting task. But, making the right choice can mean all the difference in your bow’s performance. 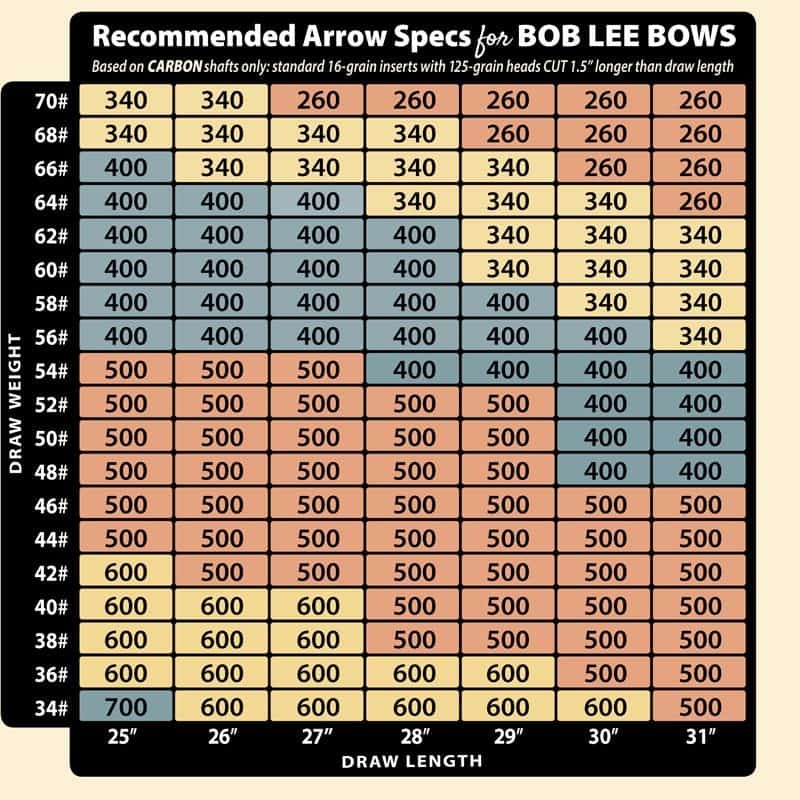 The following considerations should be made when deciding on the proper arrow for your Bob Lee Bow, but we also are available if you need help in real-time. The spine rating on an arrow shaft refers to how much flex is in the shaft. For example, a .500 spined shaft is weaker, or more flimsy, that a .400 spined shaft. Industry standards for spine measurement are determined by hanging a 1.94 pound weight in the middle of the shaft and calculating the resulting flex. In such a test, a .400 spined arrow will flex .400 of an inch at 31” long. A GoldTip .500 has the same amount of flex as a Beman or Easton .500. For a visual comparison, refer to our arrow chart to find which spined shaft will work best for your Bob Lee. If you’re a bowhunter, you may want a heavier shaft and broadhead. If you prefer a broadhead heavier than 150 grains, you will need to select a stiffer (or shorter) shaft in most cases. The more weight added to the front of a shaft, the weaker it becomes. The amount of force from the string on the shaft remains the same each shot (assuming your draw length is consistent), but the resistance at the end of that shaft becomes greater with the added weight, forcing the shaft to flex more. This concept holds true with any added weight to the front of the shaft, i.e. heavy inserts. For competitive shooters, arrow flight and a flat trajectory is most important. In order to obtain a flatter trajectory at greater distances, less weight up front is more desirable. If you prefer to shoot lighter than 100 grain heads, you will most likely have to choose a weaker spined (or longer) arrow. Category: Arrows, Bow Care and Maintenance, Outfitting your Bob Lee Bow | Tags: arrow selection, arrow shaft, arrow spine, Beman, bowhunting, draw length, draw weight, Easton, GoldTip.